As promised, here is the post focusing on several challenges related to the timing of rolling stock requirements in the “Wales & Borders franchise” (W&B) area. 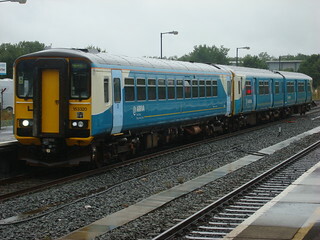 Arriva Trains Wales’ (ATW’s) current fleet is spread thin. In December 2012, over 80% of the 125 Diesel Multiple Units (DMUs) in the fleet were in use on weekdays and Saturdays*. 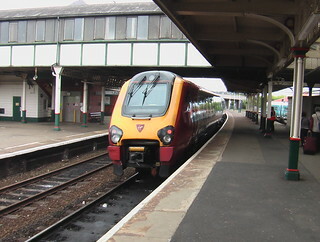 ATW introduced a 4-carriage set of mark 3 coaches to relieve overcrowding on services between north Wales and Manchester, but crowding continues to be a problem across their network. The fleet is so stretched that ATW were forced to reduce maintenance time for a class 158 DMU, which now works a morning service before heading into Machynlleth depot, to enable additional Aberystwyth services. Looking to the future, the challenges for the new W&B franchise start almost at once. 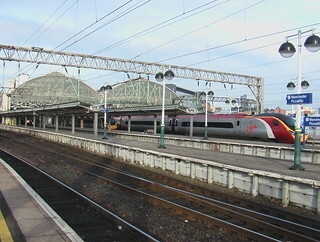 It was announced in 2016 that infrastructure works would be carried out to allow a new hourly service linking Chester to the Liverpool via a largely disused stretch of track known as the Halton Curve. The new service is due to start in December 2018. Although Northern operate the current meagre service, there are longer-term ambitions to extend the new service into Wales, and thus it is expected that the W&B franchise will take responsibility for this. Therefore, within months of the new contract, Wales’ rolling stock fleet will need to be increased in size, lest it be stretched even further, perhaps to breaking point. This is on top of crowding issues. It is of course possible that the Halton Curve service could be delayed, deferring the need to find rolling stock. The second major challenge facing the new franchise cannot be deferred. Six months later, in May 2019, the summer timetable will begin. 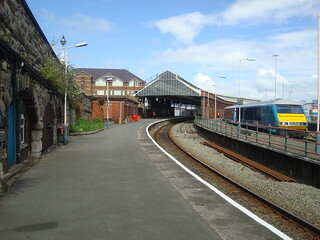 During ATW’s current franchise, Great Western Intercity 125 trains have operated on the Pembroke Dock branch on summer Saturdays. 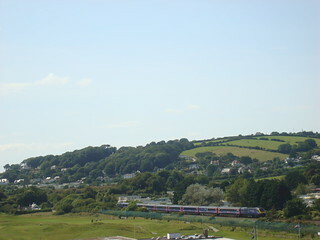 These trains provide valuable additional capacity, given that ATW’s services on the line are only 2 coaches and large numbers of tourists head to and from Tenby on summer Saturdays. The problem facing ATW’s successor is that the latest Great Western franchise agreement will see the Intercity 125 seasonal Pembroke Dock service withdrawn with effect from December 2018. 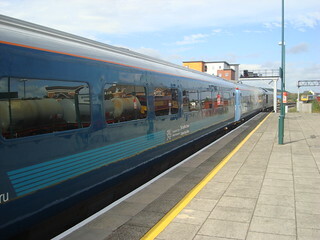 The Intercity 125s are perhaps overkill but, on a busy day, trains at least 92 metres long (four 23 metre carriages) are needed to accommodate the Tenby crowds. 4-car class 150s at 80m are unlikely to be sufficient. 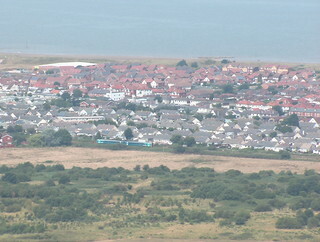 I cannot see ATW’s current fleet stretching to that, given that north Wales is busier on summer Saturdays too. If the challenges stopped there, it could be a relatively simple matter of leasing additional rolling stock (if any diesel stock becomes available in the necessary timeframe). A big complication is introduced on 1st January 2020, just over six months later. From that day onwards, passenger trains must comply with regulations concerning accessibility for disabled persons. With those regulations a rapidly looming prospect, some options for increasing the fleet to resource the Halton Curve and Pembroke Dock requirements might be ruled out. Any investment to make rolling stock suitable for W&B is unlikely to be seen as good value for money unless it produces trains that the franchise can use into 2020 and beyond. This probably rules out additional loco-hauled coaches (the only non-electric stock available right now), leaving W&B dependant on other operators releasing stock. Only 51 of ATW’s 125 DMUs are even close to being 2020-compliant at present. Of the rest, 38 probably will need scrapping (Pacers and class 153s); as would the mrk3 coaches unless complicated door modifications are carried out. A large number of trains will thus need to join the fleet by 2020, even before we consider the 36 class 150 units. These could be made compliant, those with Northern and Great Western will be, but there’s a further issue specific to W&B. Again, there is a time factor involved. The exact timing of this fourth challenge is uncertain, unlike accessibility regulations, the Halton curve and summer tourist traffic. ValleyLines electrification (or, if passengers are unlucky, conversion to tram operation) could change everything. ATW’s Pacers are largely confined to the ValleyLines network, along with at least half of the 150s. If the owners spend millions on the 150s to make them 2020-compliant, they will want them running for as long as possible in order to generate a return on investment. There is therefore a dilemma, since most of the 150s (and whatever replaces the Pacers) will be surplus to requirements when replaced by electric trains (or trams). They shouldn’t be seen as a potential cascade to other areas of the franchise, since the ValleyLines need rolling stock able to cope with frequent stations stops on a busy metro network. That sort of train cannot provide the comfortable interior, with ample leg-room etc., that is needed on the longer-distance rural routes which would be the only other use for trains with a top speed of 75mph (such as the 150s). The Last Years Of Pain? 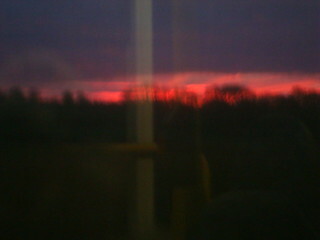 New Dawn? Will the new rail franchise offer a rosier future? Welcome, rather belatedly, to 2017. 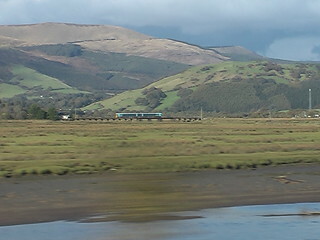 This year is potentially the last full year of the Arriva Trains Wales franchise. The end-date for Arriva’s current reign is generally given as October 2018, but the UK government’s re-franchising schedule shows a short extension is available at the discretion of the Secretary Of State for transport. That raises the question of whether this power will transfer to the Welsh government when rail franchising powers are devolved, as they are expected to be shortly. Regardless of the exact end date, the process for selecting the next operator to run the ‘Wales & Borders franchise’ has begun, with four firms (including the incumbent Arriva) having been shortlisted to bid for the contract. As the Welsh Government prepare to let the new franchise, a committee of the National Assembly For Wales is conducting an inquiry into the matter, as part of which they are running a public consultation which is open until 23rd February 2017. As part of this, they have an online survey, and following this a stakeholder meeting is planned in Shrewsbury in early March. The Invitation To Tender is likely to be issued later this year, with franchise award in early 2018 ready for the new franchise to begin in October 2018, assuming the option to extend the franchise is not taken up. The challenge now is to ensure the specification of the new contract brings improvements and provides what is needed to resolve the issues currently faced with Arriva Trains Wales (ATW), such as shortage of rolling stock. 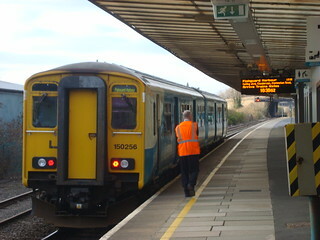 Some aspects of the current Arriva Trains Wales franchise agreement, particularly the omission of any provision for growth in passenger numbers, are widely regarded as a colossal failure. Because of this, we are enduring the pain of overcrowded, and in some cases unsuitable, trains. Perhaps now, there is a light at the end of the tunnel as the 15 year ‘no growth’ franchise draws to a close. This post is the introduction to what I hope will become a series on issues related to the new franchise. I did intend to include a look at several challenges related to the timing of rolling stock requirements in the “Wales & Borders franchise” (W&B) area in this post; however it got so long I have decided to split this introductory section off. The rolling stock challenges post will follow in the next few days.